After finishing this challenge, I decided to make a few of the posts private. If you are unable to view a specific post, that is most likely the reason. Day 1: List ten things that make you really happy. Day 7: List ten songs that you’re loving right now. 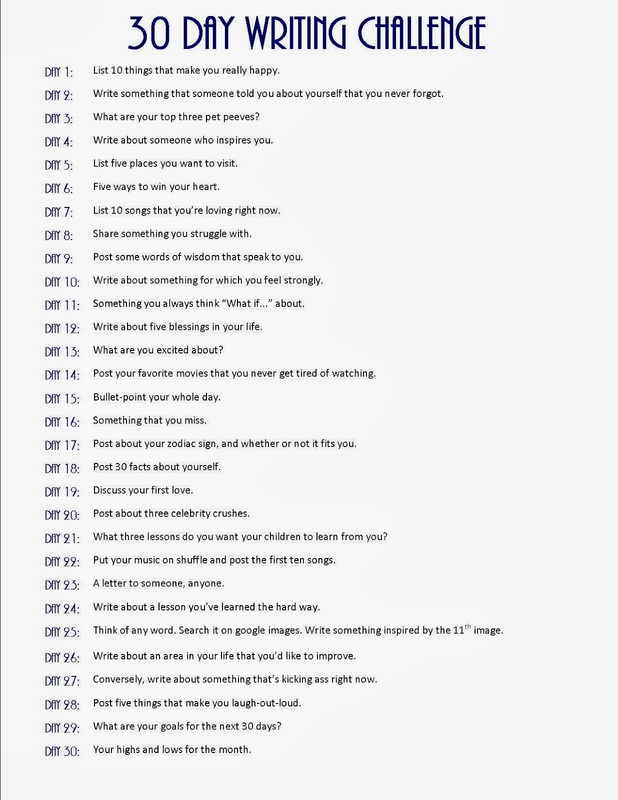 Day 10: Write about something for which you feel strongly. Day 11: Something you always think “What if…” about. Day 12: Write about five blessings in your life. Day 14: Post your favorite movies that you never get tired of watching. Day 15: Bullet-point your whole day. Day 17: Post about your zodiac sign, and whether or not it fits you. Day 18: Post thirty facts about yourself. Day 20: Post about three celebrity crushes. Day 21: What three lessons do you want your children to learn from you? Day 22: Put your music on shuffle and post the first ten songs. Day 25: Thing of any word. Search it on Google images. Write something inspired by the 11th image. Day 26: Write about an area in your life that you’d like to improve. Day 28: Post five things that make you laugh out loud. Pingback: 30-DWC #1 : List ten things that make you really happy – Wot's uh… the Deal?